Go Ask Alice was a hoax. But Dear Nobody is a true teen diary so raw and so edgy its authenticity rings off every page "I am a freak." 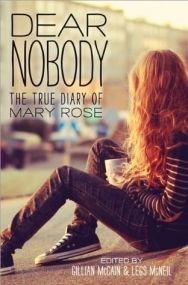 The words and drawings of Mary Rose present a gritty, powerful, no-holds-barred true experience of a teen girl so desperate to be loved, so eager to fit in that she'll go to extremes that could cost her her life. This is not a story about addiction. Or sexual promiscuity. Or cystic fibrosis. It's the story of a young woman with a powerful will to live, who more than anything wants to be heard...and loved. This compelling, emotional account ensures her voice will not be forgotten. I don't even know where to begin with this book. The array of emotions I felt after finishing Mary Rose's diary ranged from utter sadness to anger. I was sad because there is no cure for the illness that ultimately took her, but I was most upset because her story is too common. This poor child was let down by everyone she knew, whether she realized it or not. I just cannot begin to imagine what her life was life. It's hard to review a book that is made up of diary entries. They aren't fabricated or altered; you're reading her history. I can't comment on character development, because people aren't characters. I'd like to say that certain relationships were touching and left me with goosebumps, but I'd be lying. Within Dear Nobody is a history with a list of sore spots for me. First, let me start with the dirt bag mother. I am sorry to call her that without knowing her personally, but I know this type. I've worked with kids in similar home situations. But if you cannot respect yourself enough to leave an abusive and deadly relationship with a loser of a man, you are an idiot. It just floors me to know what this kid went through because of her mother's selfishness. I've seen it too many times! So Mary Rose's long list of problems begins with her mother and the lack of a strong, female role model. But I think what really got me was the Acknowledgement at the end, written by the mother. It did not match what Mary Rose wrote about. Do I think her mother loved her? Yes. Even the most apathetic mother loves their child to some degree. What gets me, though, is the number of times I read about the mother disappearing at night to be with her abusive boyfriend, or some other loser man. Or the mom not being around at all to feed her kids. Oh! My personal favorite-- the number of times she got high with her daughter. Yes, mother of the year material right there. But yet, in her Acknowledgement she looks like a saint. Of course, she has to point out that her daughter exaggerated some in her diary and that she knew she was loved. ** tangent-- IF Mary Rose exaggerated like her mother claimed, I'm going to point out the hole in that claim. Her biological father would not agree to the diary's publishing because he was worried of what was said about him.It took months of tracking him down to get him to agree to it. But that was only after reassuring him that nothing would be said about him in the book. To me, that says that this child was speaking the horrible ugly truth of her life. You can't hide or cover some things, and people don't want their shortcomings brought to light. So I don't think she exaggerated at all. I think she was perceptive and called her mom out on a lot of her BS. ** But if you read this book and the synopsis, you'll realize this child did not know love at all. She knew some horribly distorted idea of what love might be. So this idea of love... How would Mary Rose know what love it? Her father was absent. The man she thought of as a father threw her mom on the bathroom floor when she was pregnant with a child, beat the crap out of Mary Rose, and eventually threw them out on the street. Then her mom shacks up with another psycho that threatens to cut their throats. They escape him but she keeps going back. It was an endless cycle. If this is the only vision of a loving relationship with a male that she knows, no wonder she runs into the arms of the first moocher she finds. Enter Geoff. Ugh. Young love is so hard to understand. The boy is older, so he's mysterious. He has similar interests (partying and drugs). He's elusive, so that makes him poetic and dreamy. But really he takes advantage of her too. He uses her for money and drugs. He verbally abused her. It was her mother's relationship with men all over again, and you couldn't blame the child for being in it. She didn't know any better. These things upset me about Dear Nobody. I really have a hard time getting beyond the mom and her role in her daughter's dysfunctional life. But what breaks my heart the most is how real this was. So many kids in America are dealing with what Mary Rose went through. She has given the voiceless a voice, and a painful one at that. The kids might not be living with cystic fibrosis, but they know what it's like to feel alone. They know first hand the ridicule of their peers. They can relate to feeling worthless, alone, and forgotten. The need to be loved by someone--even if that person is not good for them-- is alive in all their hearts. And I have to say, it absolutely breaks me to think of how many kids feel that kind of loneliness. If you read Dear Nobody and you only take away one thing, please let it be that your words mean more than you will ever know. Don't ridicule and shame someone before understanding where they are coming from. Don't just assume you know, because you probably don't-- and being the one to step out could make all the difference in a life.